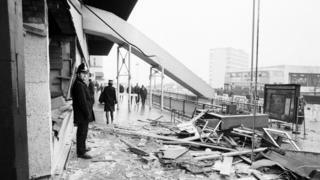 A botched IRA warning contributed to or caused 21 deaths in the 1974 Birmingham pub bombings, an inquest has found.The blasts at the Mulberry Bush and Tavern in the Town pubs on the night of 21 November also injured 220 people.Inquest jurors also concluded there was no error or omission in the police response to the warning call which would have limited the loss of life.Coroner Sir Peter Thornton QC said the bombings were "etched in the history" of the city.Jurors at Birmingham Civil Justice Centre found the warning call was not adequate for the purposes of ensuring that lives were not lost in the explosions. The jury at the six-week hearing said there was "not sufficient evidence" of any failings, errors or omissions in West Midlands Police's response to the bomb warning call, or in regards to two alleged tip-offs to the force giving advanced warning of the blasts.The six female and five male jurors determined the victims were unlawfully killed, a conclusion they had previously been instructed to reach by the coroner.Following the conclusions, Sir Peter said the "dreadful events will never be forgotten". "It would be not right to leave the inquest without paying tribute to those who helped that dreadful night," he added. "We always expect our emergency services, particularly the police and fire fighters to be there for us at the time of disaster and they were. "The coroner went on to thank the members of the public who "just did the right thing and helped as best they could". "These were the people of Birmingham shown at their best; brave generous, selfless. "A genuinely positive side of humanity in contrast to the devastation and destruction all around them." Leslie Thomas QC, representing 10 of the bereaved families, added thanks on their behalf to those who helped on the night of the attacks. "We just hope, in light of the jury's unequivocal finding that the IRA murdered 21 innocent people, that the West Midlands Police will now redouble their efforts in terms of those bombers who may still be alive to bring them to justice," he said. Who were the pub bombings victimsWho bombed Birmingham? The inquests came about after years of campaigning by families for a full account into what happened that night.A botched police investigation led to the 1975 jailing of the Birmingham Six, but their convictions were quashed by the Court of Appeal in 1991. There was a dramatic twist towards the end of evidence at the inquest, when a former IRA member named the four the men he claimed were involved in the bombings as Seamus McLoughlin, Mick Murray, Michael Hayes and James Francis Gavin.The man, identified in court only as "Witness O", said he had been authorised to give those names by the current head of the IRA in Dublin.